Thank you guys so much for your encouraging comments on my last post – I was so nervous about blind stitching the facing down on my wrap dress! I powered through and got the dress finished in time to wear it to breakfast with the friend who very generously let me borrow her vintage Vogue 1548 pattern. Unfortunately, while I was able to keep my stitches mostly invisible on the top (see above), I was not so successful on the hem (see below). After wearing the dress for the day, I realized the difference between the top and the hem was the tension in the stitches. You guys had warned me about making my stitches too tight! The moral of the story: keep those stitches loose! Looks beautiful–love that color! Looking forward to more photos! Thanks! I just have to make the time to get in front of the camera again! You must post the whole dress, I am about to make my first wrap dress and a little nervous! Yours looks really good! I plan to post the full dress soon! Good luck making your wrap dress – this one was my first, too. Good tip! That fabric is gorgeous…. Thanks! 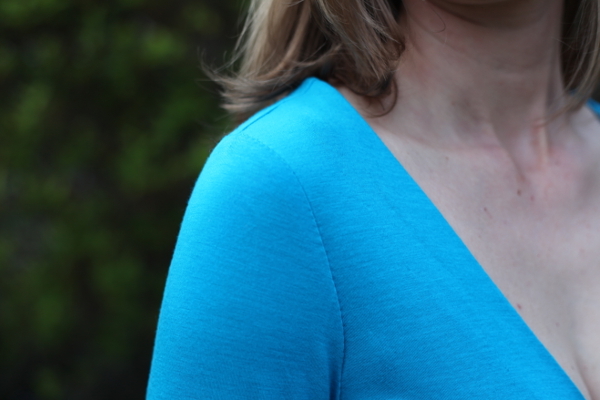 The fabric is a silk jersey, but it’s much thinner and drapier than previous silk jerseys I’ve worked with. Shows every lump and bump! Ha! You have a very pretty colour there. The fabric seems so soft too. The blind stitching really works, when loose! Absolutely gorgeous! Love that color with your skintone. Gotta give you mad props — I couldn’t even understand the directions for a blind stitch much less do it myself! !